Prof. Abdul Aziz Al Hammed Rector of PSAU received at his office Dr. Ahmad Ajina Acting Dean of Business Administration College, Dr. Faisal Al-Khulaifi Vice-Dean for Graduate Studies, Scientific Research and Quality, and Dr. Mohammed Al-Chalafan, Vice-Dean for Academic and Educational Affairs in the besides, the presence of Assistant Vice-Rector for Academic and Educational Affairs Dr. Meshary Al – Osaimi. At the beginning of the meeting, Rector welcomed both the dean of the college and his companions. He praised the important role played by the College of Business Administration inside and outside the university. Rector expressed his happiness with the achievements made by the college during the last period. 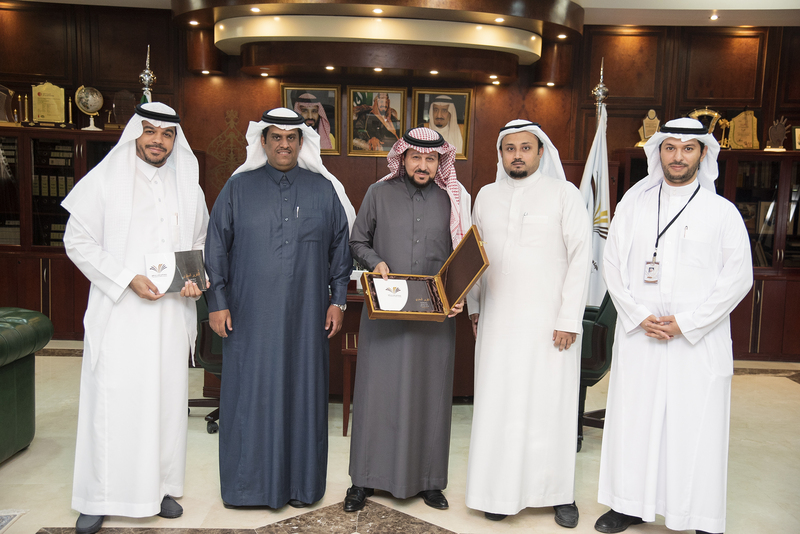 During the meeting, he received the annual report of the college for 1438/1439 H.
It worth noting, that this report reflected the aspects of excellence of the College of Business Administration in Al-Kharj both in terms of research that distinguish the college at the level of the university, and in terms of the number of published research or in terms of the quality of publication in scientific journals classified in the global databases, most notably Scopus, Web of Science (ISI). The report also reflected the aspects of excellence in the student activities, which make them always come in the center of excellence and leadership at the university level. The report did not neglect an important aspect, which is related to the service and development of the community through the activities and distinguished relations of the college by virtue of its specialization with companies and institutions concerned with the development and development of business in Al-Kharj. Rector expressed his happiness with the report's information, statistics, and pioneering activities, wishing the College of Business Administration more progress.